Fee for late filing of returns is Rs 25 per day for CGST and an equal amount under State GST. GST-related laws provide for levy of late fee to discourage delayed filings of returns, the fee for which has been brought down for various categories during the course of implementation of the indirect tax regime. The collections under late fee are net of reversals. A total of Rs 4,172.44 crore was collected by the government as late fee for delayed filing of various goods and services tax (GST) returns since the implementation of the indirect tax regime on July 1, 2017, till February 4, 2019, Finance Minstry data showed. The fee for late filing of the returns is Rs 25 per day for Central GST (CGST) and an equal amount under State GST (SGST). However, those businesses who have to file returns but have ‘nil’ tax liability are required to pay a fine of Rs 10 under CGST law, and an equal amount under SGST law. While providing the data on mop-up from levy of late fee in reply to a query in Lok Sabha recently, Minister of State for Finance Shiv Pratap Shukla, said: “Late fee is levied u/s 47 of the CGST Act, 2017 on any registered person who fails to furnish returns by the due date at the rate of Rs100 every day during which such failure continues subject to maximum amount of Rs 5,000. To ameliorate the concerns of taxpayers and to smoothen the transition to new regime the government had reduced the late fee for delayed filing of details in Form GSTR-1 and returns in Form-GSTR-3B and Form GSTR-4 to Rs 25 for every day during which such failure continues, subject to maximum amount of Rs 5,000 under CGST and an equal amount under SGST, he said. The GST Council in its 31st meeting held on December 22 had announced a one-time waiver for late filing penalty for those who are supposed to file GST returns till March 31 following demands for the same from several quarters. “Late fee shall be completely waived for all taxpayers in case Form GSTR-1, Form GSTR-3B & Form GSTR-4 for the months/ quarters July 2017 to September 2018 are furnished after December 22, 2018 but on or before March 31, 2019,” the ministry statement had said. Also, the due date for filing of annual returns was extended up to June 30, 2019. Under GST regime, registrants are supposed to file GSTR-1 which is the final sales return and GSTR-3B return, which is the summary sales return filed by businesses. GSTR-4 is filed by businesses who have opted for composition scheme under the GST law. As on December 27, 2018, 1,17,48,408 taxpayers were registered under GST which include 60,73,574 existing taxpayers who have migrated to GST and 56,74,834 newly registered taxpayers. While revenue from direct taxes are estimated to exceed the initial budget target by Rs 50,000 crore to Rs 12 lakh crore in 2018-19, the goods and services tax collections have fallen short of the budget target by Rs 1 lakh crore, with revised estimate for 2018-19 pegged at Rs 6.44 lakh crore, according to interim Budget 2019-20 presented on February 1. GST collections have remained below estimates, but average collections have improved in the current fiscal year over the previous year. 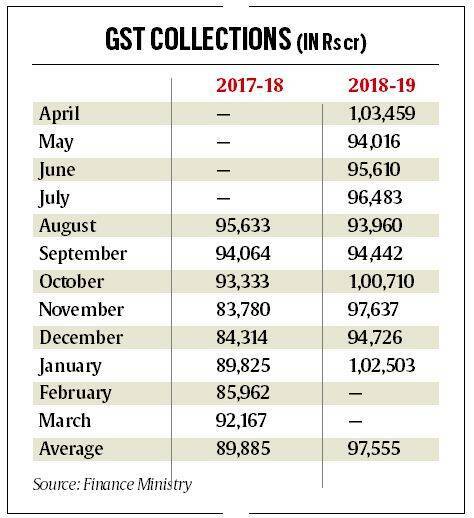 The average monthly gross collection of GST in 2018-19 till the month of January is Rs 97,555 crore, as compared to last year average monthly collection of Rs 89,885 crore.